An add-on that automates the clicking of Quests and NPC Gossip dialogues. Automatically turns in repeatable or regular quests, accepts quests, and selects the appropriate options from NPCs. Never have to talk to an NPC again! To bring up the Options window, type /ti window. To bring up the Recently Visited NPCs window, type /ti recent. Turn In keeps an NPC database, to allow you to customize your interactions on a per-NPC basis. Whenever you talk to an NPC, it appears in your Recently Visited NPCs window. From there you can decide if you want to add it to the Database so you can customize his options. Simply click the + button to add the NPC to the DB. After Adding an NPC, you can check the checkbox next to its name in the NPC list and then rearrange or activate/deactive his options to your liking. 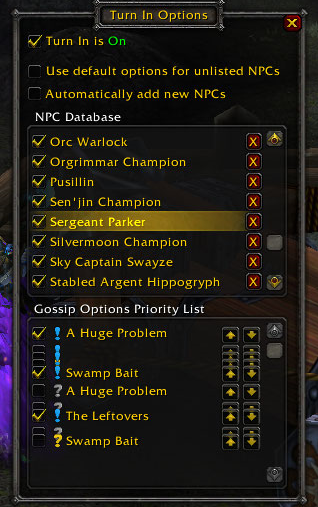 If you uncheck the checkbox next to an NPC's name, it will use the default option set. If you want Turn In to specifically take no action for an NPC, simply deactivate all of his options, don't uncheck his checkbox in the NPC list! When an NPC does not appear in the Database, Turn In uses the default option set to resolve interactions with it. You can customize the default option set by not having an NPC selected in the options window. The Use Default Settings checkbox determines whether talking to NPC not in the Database will use the default options or do nothing at all. The Automatically Add NPCs checkbox will cause all of your new NPC visits to automatically add the NPC to your NPC DB. Turns on the mod, from now on all quests will be automatically chosen and completed. Additionally, any available quests will be accepted, and gossip options will be automatically chosen. Special Thanks to Florrail and Makhno for beta testing like pros! Extra Special Thanks to Arcanemagus of Hyjal for extra code and feedback! Is there a way to get "Begin pet battle." gossip option added to the defaults? I've been using TurnIn for years now -- thanks! -- and for some reason it's taken me this long to try to figure out if it was possible. Tezran <Master of Fate> does not appear in /ti recent. also not available in config window. ... really? This was one of the first new NPCs I configured for myself and I didn't have an issue. After reinstalling WoW this addon doesn't auto accept/complete quests and I can't figure out why because it worked before and nothing else has changed. Any ideas? Reinstalling doesn't work and the addon is turned on ofc. Can you try moving the TurnIn.lua file from your SavedVariables directory and see if that fixes it? Gonna try that now and test it. I will update this post after. Update: Have removed it but it seems that nothing has changed. Yes, thank you that fixed it! Would you consider adding an option to flip the behavior of the shift key? Holding Shift-key enabling the functionality instead of disabling it? I would consider it along with all the other UI overhauls it needs. Is there a limit to the amount of entries an NPC can have listed? I seem to get this error for NPCs that have several entries. Currently, the NPC in question is Brother Pike and he has 16 entries already and it won't add anymore. Most of them are for quests, and I don't even use this addon for quests, I use it for dialogue. name = "Shrine of the Storm: The Missing Ritual"
(*temporary) = "Shrine of the Storm: The Missing Ritual"
(*temporary) = "attempt to index local 'entrytext' (a nil value)"
Also, is there a way to not show entries that aren't checked in the priorities list? Yeah, this is a limitation of the UI code I wrote back before you could spawn new frames programmatically. I want to revisit the UI but it's a big project that I haven't had time for lately. Why does this addon not execute to display its main window when the /turnin window command is placed in a saved macro and bound to a button? This has worked for every other addon I have encountered that relies on chat commands rather than Blizzard's Interface|AddOns or LDB. Typing it versus streaming it from a saved macro should have an identical result, but for this one addon it doesn't. I have an interface issue when selecting an NPC with multiple options in his/her dialogue. I've added a screenshot below for reference. (*temporary) = "attempt to concatenate field 'name' (a boolean value)"
wow. I'll see if I can reproduce it. 2.1.8 fixes this - for all the NPCs you already added that are broken, deleteing them should work. You'll need to re-add them afterwards.